Labels (or tags-categories of Wordpress) can be one of the most important navigation elements of a blog. Unfortunately, they are also one of the most misunderstood and misused elements of a blog. A good labeling/tagging system on your blog can help your readers discover your content easily, increasing page views, and, sometimes, even subscribers/followers. On the other hand, not having any or having too many labels/tags can be a major turn off for the readers. So how do we use labels and tags to our advantage? Use Labels as Topics and NOT as Keyword Spam! Off late, I see more and more bloggers stuffing their posts with dozens of labels/tags, as if they were keywords. Only one post on their blog might have that word, and they make a separate label for it! What purpose does that serve? Remember: Labels are for readers, and readers look for topics. Keywords are for search engines, and search engines look for those keywords within your posts. Putting keywords as labels benefits neither your readers, nor the search engines. Do you really need separate tags for “book” and “books”? Or for “entrepreneur” and “entrepreneurship”? Or even for “reflections” and “food for thought”? Not really. You need to decide on one label, i.e. one name for one topic, and then use it consistently on all posts falling under that topic. Otherwise, the whole tagging system on your blog becomes useless. Please DO Display Labels In the Sidebar! A lot of bloggers today advise against displaying labels in the sidebar. At one point of time, I did take the tag cloud away from my own blog, but then my sister gave me some valuable feedback. A little bit about my sister… She is not a blogger, not even too much into web browsing, and she has no idea that all those “options and things” on the side of the blog are, together, known as the sidebar. In other words, she is one of those people who make up roughly 70% of our reader-base. My sister made a very valid point above, but, the keynote in her point was “at a glance”. If the list of labels or the tag cloud is too long to be scanned at a glance, then it is of no use. Look at your blog’s tag cloud and then ask yourself. Would you scan through such a huge tag cloud on some other blog? If you won’t, then chances are that nobody else will either. So stick to a limited number of topics or labels. Or, if you are on Blogger, you can even configure your Labels widget to show selective labels. I don’t know if Wordpress also has this feature at the moment. Make Labels A Part Of the Navigational Structure. Wordpress users will probably disagree with this. Most Wordpress blogs use ‘categories’ for navigation and ‘tags’ for keyword stuffing. I think it’s a waste of ‘tags’. People like my sister don’t know the difference between categories and tags and labels. If they see a topic that interests them, they will click on it. IF they SEE it, that is! Blogger doesn’t allow categories, but it does allow more than one Labels widget in a blog, and that can be used to create very systematic and useful navigational systems. On my craft blog (KraftyFingers), I have used three such widgets to organize my content product-wise, technique-wise and tag-wise. Have a look to understand better. Labels and tags have a lot of potential. I personally prefer “clouds” over “lists” because “clouds” are shorter and more easily scanned that “lists”. If used judiciously, the tag cloud can and will be used by your readers to access more of your content. Do you display labels in your blog’s sidebar? Do you currently use them as a part of the navigational structure on your blog? Do you stop to check out the tag cloud on a blog you’re visiting for the first time? This is my 12th post for 2015 AprilAtoZ. 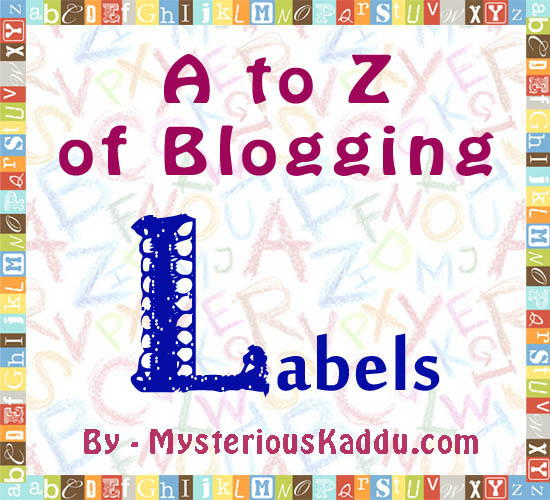 Link to the previous post: A to Z of Blogging: K - Kaleidoscope. Yes, keyword stuffing is there in Wordpress tags but it's not a waste of tags for that blogger. It gives more visibility in the Wordpress system at least. So it's useful. Having only recently shifted to self hosted Wordpress, I know I have a lot of tags, and I still do use keywordish tags :) But I don't write on a variety of topics, so that's okay. This was quite informative. I have never put labels or tags on my blog. Although, I often think of doing it but procrastinate. But your post does make me see why it is useful. Thanks for sharing! Ok that makes sense then. If it comes of use in the Wordpress system. You can put in a tag cloud though... a selective one if possible. It will help us find your stories on a certain topic/genre. @Vinodini: It's a lot of hard work, but definitely worth it. Shilpa, you have a priceless archive of content! And thankfully, you have that Archive page in your menu bar. That's my favorite place on your blog! Princess, you're on blogger. Just go for selective labels in your existing tag cloud widget. I agree less is better. I don't have labels or tags for my posts, although I did do this for a while in the past. I do like it if blogs have a tag cloud/categories section and yes, it's easier to find what you are looking for. I'm in the process of cleaning my categories but with over 1200 posts, that's taking a lot of time!! Thank you for dropping by, Stephen. Why did you remove them? I find them quite useful. Melissa, I also had a lot of redundant tags earlier. Then I went through all my posts in 2013, and edited the tags on them one by one, to make the tag cloud leaner. Took me several days. Then in Jan this year, I had a go at it again... got rid of some more unnecessary tags. It's a tedious process, but totally worth it. Oh yes, Sanch! It takes ages. I actually worked with a pad and pen. Made a list of how I wanted everything organized on my blog... the entire menu bar, you know. 'Coz I'm just so obsessed with things being in order. And then I attacked the posts. All the best to you for the process! :D I'm looking forward to your cleaner tag cloud.